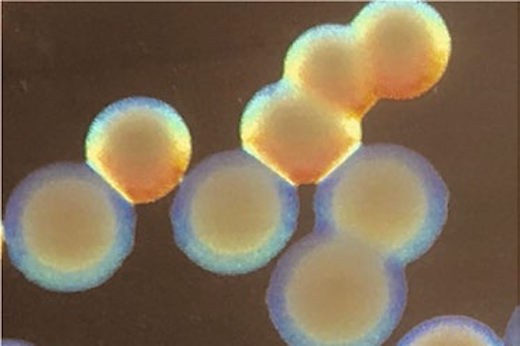 Top colonies: opaque virulent form of Acinetobacter baumannii. Bottom colonies: translucent avirulent form. From Chin et al Nature Microbio (2018). The results were published Monday, April 23 by Nature Microbiology. Postdoctoral fellows Chui Yoke Chin, PhD and Kyle Tipton, PhD are co-first authors of the paper. Eileen Burd, PhD, director of the clinical microbiology lab at Emory University Hospital, is a co-author. The research was supported by the National Institute of Allergy and Infectious Diseases (R21AI115183, R01AI072219, R21AI098800), a Veterans Administration Merit Award (I01BX001725), the Burroughs Wellcome Fund and the Georgia Clinical and Translational Science Alliance (UL1TR000454).